All I have done is copy and paste these seven good news stories. Maybe once a week all us bloggers can post one new good news story and help change all the bad news we hear. Hope you enjoy. Be sure to listen to the music at the end also. Many people are homeless, not because they’re lazy and don’t want to work, but because they have had horrible things happen to them. We can all learn compassion from this little girl and her huge heart. 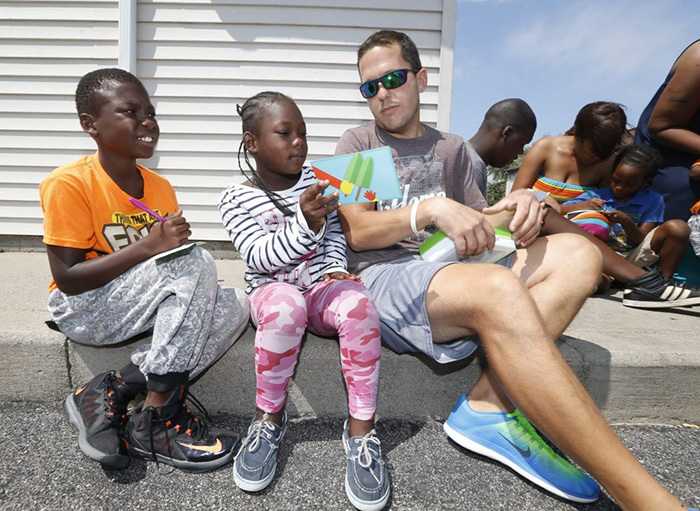 2) Donations are pouring in for James Karagiannis, Buffalo’s “Ice Creamcyle Dude.” Karagiannis, 36, owns a fleet of five cycles that visit the city’s disadvantaged neighborhoods, selling ice cream for just $1, or for free in exchange for a correct answer to a history or math question. With his reflector sunglasses and sneakers the color of a blueberry Popsicle, Karagiannis is a familiar sight in many parts of the city. Still, nothing is free. The youngster must answer a math or history question. News spread fast on social media about Karagiannis’ business model, so he started a “Pay It Forward” campaign to allow people to buy ice cream for deserving children. In return for your donation, Karagiannis has the child who receives a free ice cream write a thank you card which he then mails to you. 3) More than $167,000 dollars has been raised for a 19-year-old who was found sleeping in a tent outside the gates of his college last weekend. Fred Barley, who is homeless, was discovered by two police officers responding to a trespassing call near a parking lot at Gordon State College in Barnesville, Georgia. 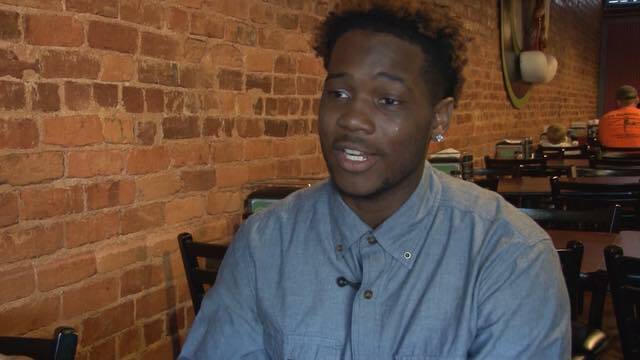 He told the officers he had ridden his little brother’s bicycle six hours to register for classes for his second semester of college. In addition to the bike, Barley had two duffel bags containing all his wordly possessions and two gallons of water. All he had to eat was a box of cereal. The officers brought Barley to a nearby motel and paid for two nights accommodation. One of the officers, Dicky Carreker, posted Fred’s story on Facebook and it went viral. A GoFundMe page on Barley’s behalf has raised nearly $168,000 dollars as of Saturday evening. 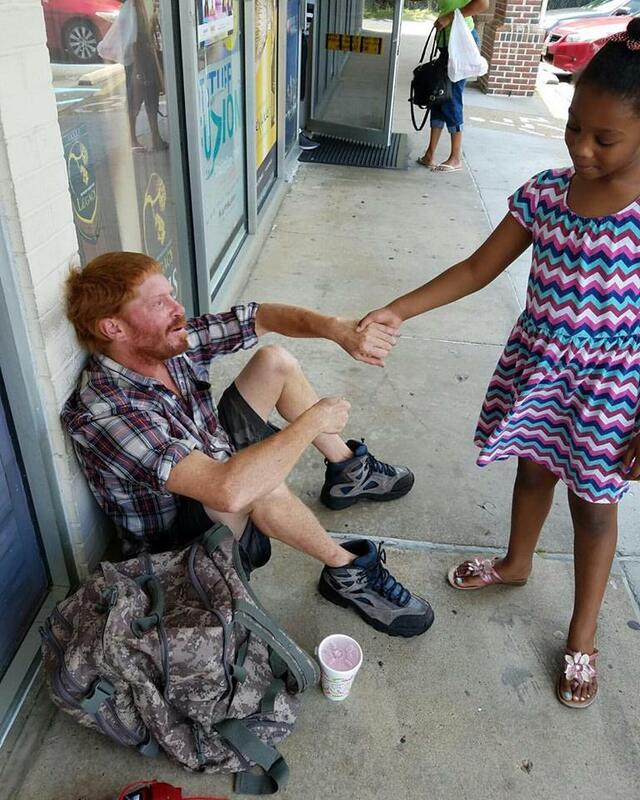 4) A simple act of kindness from one Louisiana man is giving all of us a little slice of hope. James Varnado brought a smile to many faces in Kenner, Louisiana, when he began helping Target shoppers to their cars in the middle of a heavy rainstorm with his trusty umbrella. Inside the store, another shopper, Deepak Saini, witnessed Varnado’s good deed and captured the moment in a photo that later went viral on Facebook. In the photo, Varnado appears to be escorting one of many shoppers to their car despite the downpour, proving that not all heroes have capes — some have umbrellas. 5) Instead of getting presents for her birthday, Samya McLaughlin, 9, wanted to send a message. 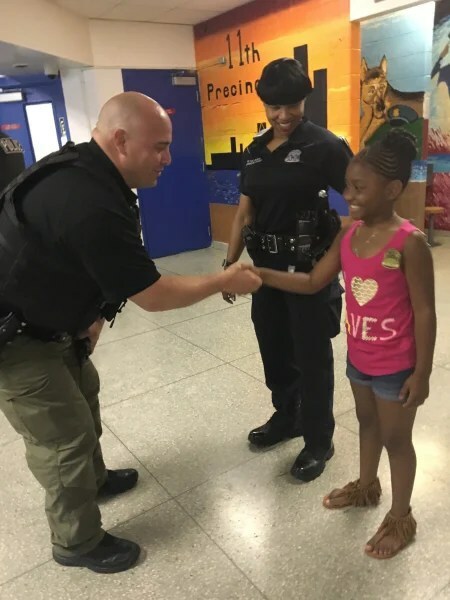 After watching news about the deadly shootings of Dallas police officers on July 7, Samya decided she wanted to use her birthday money to buy lunch for everyone at the 11th Precinct in her local neighborhood in Detroit. Joining her mother, Sierra McLaughlin, and her father, Sam Walker, along with several other family members, Samya surprised the local officers with a brown bag lunch on July 9, a day before her ninth birthday. She helped pass out about 30 bags with sandwiches, fruit, chips and a cookie. 6) One woman had a “proud mommy moment” last Monday when her young son stopped and shared a compassionate moment with local policemen. According to Kelly Garza’s Facebook post, she had just finished eating breakfast with her 6-year-old son at a Bob Evans in St. Petersburg, Florida. On the way out, her son spotted policemen eating and approached them. “My sweet boy prayed over these officers, for safety and thanked them for their service,” Garza wrote in her post. “Joshua is being brought up in a very loving church, where he has learned that it’s ok to share his faith and that it’s an act of love to pray for others,” she wrote. 7) A Connecticut police officer with a passion for helping children posted an adorable note two siblings wrote him while he was recovering from a knee injury. 8-year-old Malik and 9-year-old Tasha thank Officer Anthony Nolan for “being like a dad for us” and reading to them. Nolan, who was injured when he fell at a traffic stop a couple of weeks ago, told TODAY.com he was surprised when he recently found the letter duct-taped to his front door. Nolan, an officer for the New London Police Department, said he first met the siblings while working on the beach a couple of years ago. That sparked a conversation about books and reading, and ever since then, Nolan has been visiting the children at least once a week to read or take them to the park or for walks on the beach. He said he volunteers with many children in the New London area, especially ones who don’t have a father figure, or who live with a single parent or another relative who could use some help. God, Is This Your Answer? It’s inspiring really, just makes you wanna do good in return. Absolutely delightful! We do need more good news!! My heart is smiling! Thank you for these beautiful stories!! Thanks for reading. We all need to hear more good stories. Thanks for reading. Going to try to do one a week. Good news needs to be heard. Nice..kind of needed that today, Robert, Thanks!